White Christmas is a beautiful Christmas song written by Irving Berlin, and made popular by Bing Crosby in the early ‘40s. The song was the best selling single of all time until 1998, according to the Guinness Book of World Records, so you chose a great song to learn for Christmas! Our White Christmas guitar lesson will teach you a nice accompaniment cover that you, or someone else can sing along to. 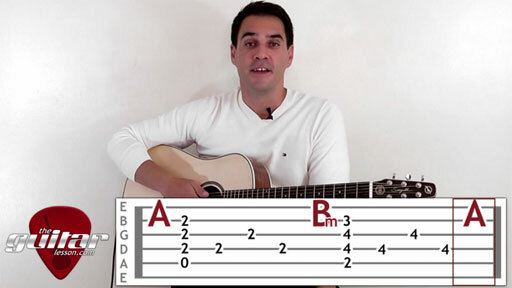 You’ll be learning a number of chords, and be playing them in a set chord progression, as well as use different chord voicings to follow along with the melody of the song. The key to being able to play this song is getting the chord changes nice and fluent. It is not a fast paced song, the original version was at 78 BPM, so you won’t need to do any superhumanly quick chord changes. There is 1 barre chord in the song, the B minor, which is why I decided to put it into the intermediate category. White Christmas was written in 1940 by a Irving Berlin, who was commissioned to write a track for the 1942 movie Holiday Inn starring Bing Crosby and Fred Astaire. Bing Crosby recorded the song with the John Scott Trotter Orchestra in just 18 minutes. White Christmas is the 5th most performed Christmas carol according to ASCAP (American Society of Composers, Authors and Publishers). Even a book was written about the song in 2002, entitled "White Christmas: The Story Of An American Song". Irving Berlin (1888-1989), the writer of White Christmas, was an active songwriter for over 60 years, and wrote the scores for a bunch of Broadway shows and Hollywood movies. He was nominated for Academy awards 8x. Also legendary composer George Gershwin called him "the greatest songwriter that has ever lived". White Christmas has reached the no.1 position on the charts a total of 25 times, and sung by stars such as Frank Sinatra, Cher, Diana Ross, Nat King Cole, and of course, the original by Bing Crosby in the 1942 film Holiday Inn, who’s version we’ll be learning today. Sorry, but you've reached a premium content area. The download of the White Christmas tablature file is only available to premium members. Sorry, the same goes for the backing track. To download the backing track to White Christmas, please log in and revisit this page.